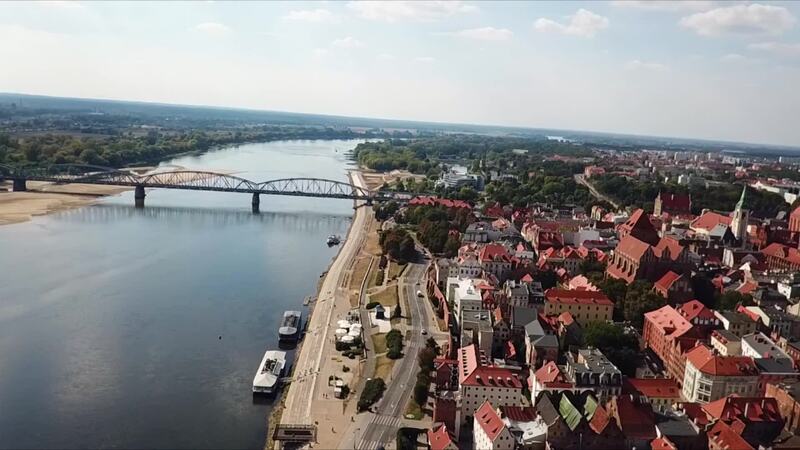 Description: Toruń,Poland was founded by the Teutonic Order, in the 13th century. The unique spatial layout of Toruń has remained unchanged for 700 years. During the Middle Ages it developed a commercial role as part of the Hanseatic League. In the Old and New Town, imposing buildings from the 14th and 15th centuries (among them the house of Copernicus) are striking evidence of Toruń's rich past. A Gothic town hall built in the late 14th century is the centrepiece of Torun’s old town. It is one of the biggest brick buildings of its kind in Europe. For centuries, it was the administrative and commercial hub of the city; it was near here that fairs were held, tribute was paid to the rulers, knights fought in tournaments, and the condemned were publically executed. Today, the building houses a district museum, where visitors can see local handicraft and Polish paintings from the 19th and 20th centuries. One of the medieval tenements from the second half of the 15th century houses the Home of Nicolaus Copernicus, the astronomer who proved that the Earth does not sit at the centre of universe, but rather orbits the sun along with other planets. Torun’s medieval city walls are the oldest in Poland. Their first section dates back to 1246-62. Almost from its very beginnings, the city was surrounded by two rings of defence walls separated by a wet moat. A single wall was only built along the Vistula riverside. A three-kilometre long section of Torun’s city walls had 54 towers, 12 gates and two barbicans proper. Nine towers and three gates have survived to this day. An old Teutonic castle was part of the city’s defences alongside high walls, towers, and gates. Today, it is a favourite site for walks, theatre performances, and music concerts. An attractive walking route is also Podmurna Street, Torun’s longest medieval street. This cobbled road is full of charming nooks and historic monuments. The street begins near the moat and the Burgher House, and weaves its way next to an historic granary, the Feline Head tower, and the Mint Gate. Its 15-metre-high Leaning Tower constructed at the turn of the 14th century is inclined like the famous Tower of Pisa.